Ansonia Bonn China , circa 1895 "La Nord" Open Escapement. 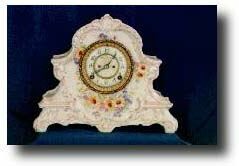 Case: Bonn China Floral; 12"h.14.5" w; perfect Porcelain dial. Works: Ansonia time and strike on gong Reference:Ansonia Clocks Tran Duy Ly; p. 274 Condition: Case - Excellant; Works - Cleaned, no repaired parts.